Sorry I've been MIA lately guys! No fear.... lots of fun things in store for Amanda's Parties To Go! I've been working up a creative storm of sorts designing some new party sets and collaborating with some wonderfully talented ladies in the party business. And LUCKY for you... I've got an upcoming St. Patty's Day freebie, too, so stay tuned! 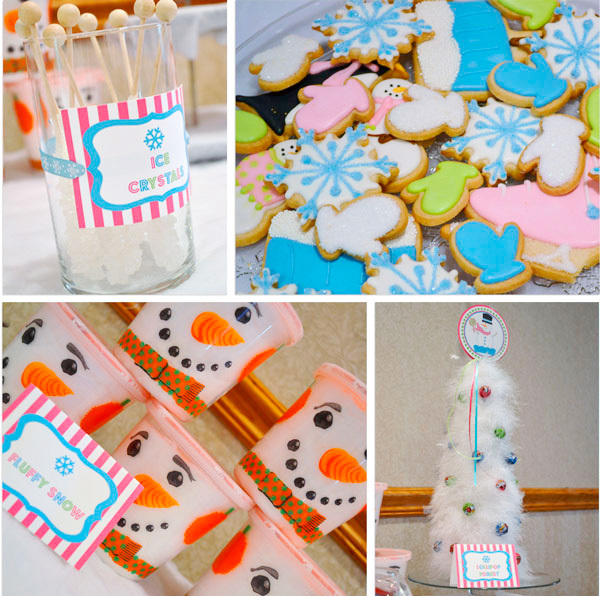 Until then, I thought I'd share a sweet party my customer, Andrea of Martin Lane Designs, sent me of her daughter’s Winter Wonderland 1st birthday party. This is one to save or bookmark for next winter with some cute ideas and DIY projects, too. 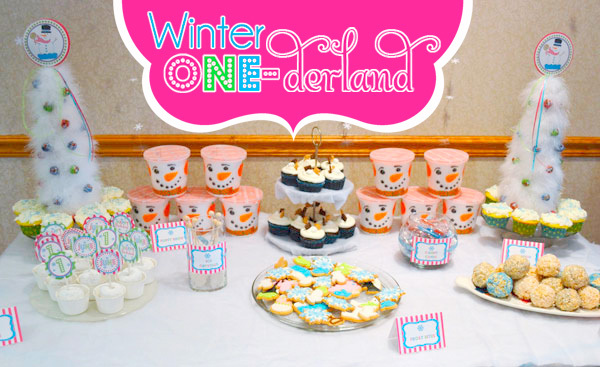 In describing the party Andrea says, "Since our daughter was born in the middle of a crazy blizzard, we decided on a winter wonderland theme for her 1st birthday party. 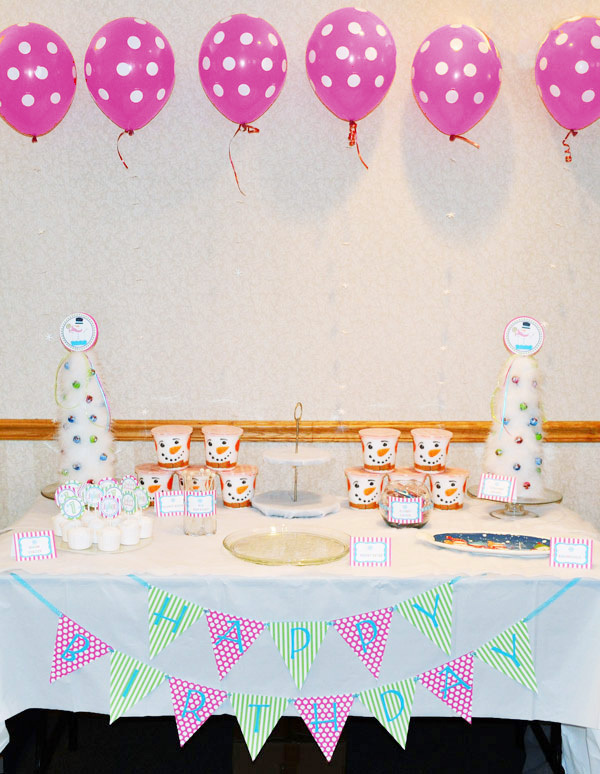 My color inspiration came from the snowman birthday party package that I purchased from Amanda's Parties To Go. The package had a great combination of pink, lime, and robin’s egg blue with polka dot accents. So, I carried the theme throughout the rest of the party decorations. All of the printable papers and signs really came in handy for my DIY projects. Best purchase ever." Well, Andrea, I'm so glad you like the set! It really is a cute one. Andrea designed the invitation herself saying it's her favorite part of throwing a party. She found a basic set of white cards and envelopes in her supply stash. First, she designed the invitation layout and printed out the text for each invitation. Then, she used the 2” and 2 ½” circle cutouts from my SNOWMAN PARTY PRINTABLES to decorate the front of the invite. Voila. Simple and cute invitations. "I bought bright white pom-poms and pre-cut snowflakes to hang from the ceiling. For the dessert table, I decided to use white and clear serving pieces so that the goodies really stood out. 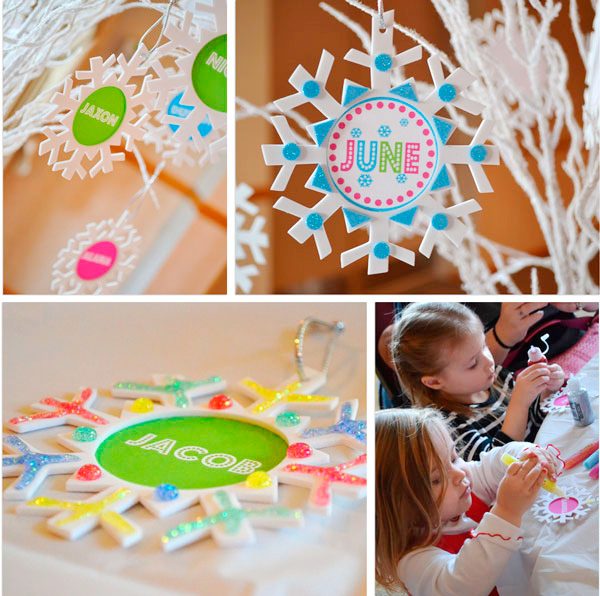 The balloon backdrop was inspired by this falling snowflake garland via Oh Happy Day! Super whimsical and easy. The Happy Birthday bunting banner was created by moi but I found this great bunting pattern template at Chickabug. My favorite pieces on that table have to be the Lollipop Forest trees. They were so easy to make and really added a fun element to the table. The desserts were all winter themed - frostbites (cookies), fluffy snow (cotton candy), ice crystals (rock candy), snowballs (rice krispie treats rolled in pearlized sugar), snow stacks (powdered donuts), candy canes and of course, cupcakes! We also had a hot chocolate bar with different toppings to add - mini marshmallows, crushed candy canes, whipped cream, cinnamon, and sprinkles. In order to keep the kids occupied, I had a few things in mind. First, was creating a “Snowflake Station” where the kids could decorate their own snowflakes. I bought some snowflake ornaments from Target (Christmas clearance racks). The circle in the middle is actually supposed to be for a picture but instead, I printed out different colored circles with each child’s name and glued them to the back. The snowflakes were all hung on the white, glittery tree branches, waiting for them to decorate. 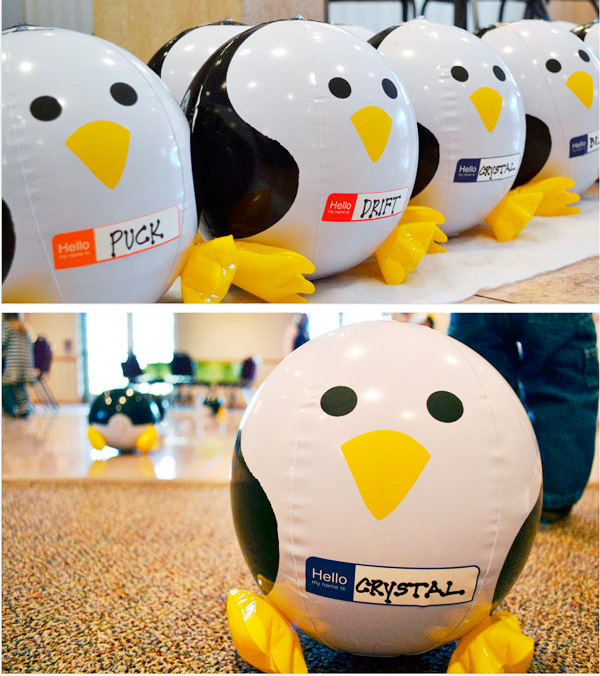 We also had an “Adopt-a-Penguin” station, where each kid could pick out an inflatable penguin to take home. 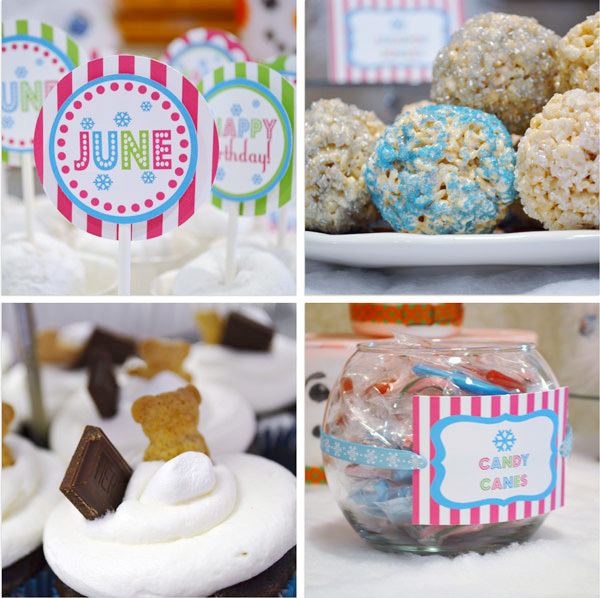 I loved how cute they were and the fact that they kept the kids occupied for the entire party." Andrea reminds us, "The beauty of having a winter wonderland birthday party is that all of the decorations can be re-used during Christmas and the winter season as well. Or, you can use your existing winter Christmas decorations instead of buying new ones." 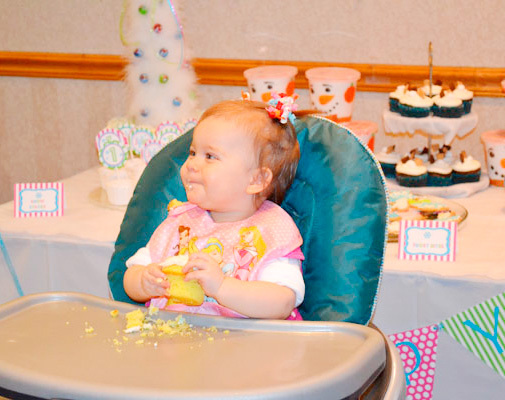 Thank you, Andrea, for sharing your adorable party with us! Be sure to visit Andrea at her blog, too! I'm planning a winter Wonderland themes bday party for my twins in December and I was wondering if you could tell me where u bought those snowman cups that you put the cotton candy in. bracelet to buy as an investment, you can rest assured you are making a good You may have to shift your hand slightly to pick up the B on the third string, fourth fret.Box Pattern 4 Meteorites have been found all over the world but some of the best hunting places to start looking for them include deserts and dry lake beds. It seems this team is still two or three proven rotation horses away from contending.